Running more miles each week strengthens your heart and adds more capillaries to deliver more blood to your muscles, improves your leg strength, and builds your mental strength - all of which help you run faster and longer. Just be careful that you don't increase your overall mileage by more than 10% per week. Bigger jumps in mileage can lead to overuse injuries. This may seem like common sense, but if you want to run a faster marathon, pick a marathon that's known for being fast. Some runners choose scenic marathons like Honolulu, and then find out that the course is not fast, either because of hills, weather or crowded conditions. Do your research and find out about the elevation on the course, typical race day weather, and whether crowds may slow you down. Beginners tend to run their long runs at a slow pace, which makes them good at running long, slow miles. But if you're shooting for a certain marathon time, you'll need to focus more on your goal race pace. You definitely don't want to run your entire long runs at marathon pace (MP), but it helps to run the last 1/3 to 1/2 of your long run at your anticipated marathon pace. Running at MP towards the end of your run is good training because you'll be picking up the pace when your legs are already fatigued. And if you can run at your MP (or faster) in those last few kilometres that's a good indication that your goal time is realistic. Kilometre repeats are one of the best speed workouts you can do to run a faster marathon. Try doing kilometre repeats once a week, starting with 2-3 repeats and working your way up to 6 repeats. You should run them at about 10-15 seconds faster than your realistic goal marathon pace and recover (at an easy pace) for a half kilometre in between repeats. Study the course profile on the marathon's web site and find out how many hills you'll be facing and at what kilometres. If you know when to expect hills on the course, you'll be prepared mentally and you can pace yourself properly for them. If you're running a local marathon, try to do some long training runs on the marathon course. In addition to being good physical preparation for the race, having run on the actual course will help you feel more mentally prepared. Even though race courses are measured accurately, many racers run a longer distance (and therefore a slower finish time) by following every curve in the road. A tangent is a straight line that just touches a curve, so the concept of "running the tangents" is to run the shortest distance possible by running straight from one curve to the next. Your first marathon may have been sabotaged by numerous stops in the port-a-johns. To avoid wasting time making pit stops, make sure you're eating and hydrating properly during your training so that you don't try anything new on race day. Avoid foods that are known to trigger runner's trots and don't drink so much that you have to constantly stop to urinate. Yasso 800s are a popular workout among runners who are trying to achieve a specific marathon goal. The idea is that you take your marathon goal time in hours/minutes and convert this to minutes/seconds (so a 3 hour 10 minute marathon would be 3 minutes 10 seconds), and then try to run 800-meter repeats in that converted time. Here's exactly how to do Yasso 800s. 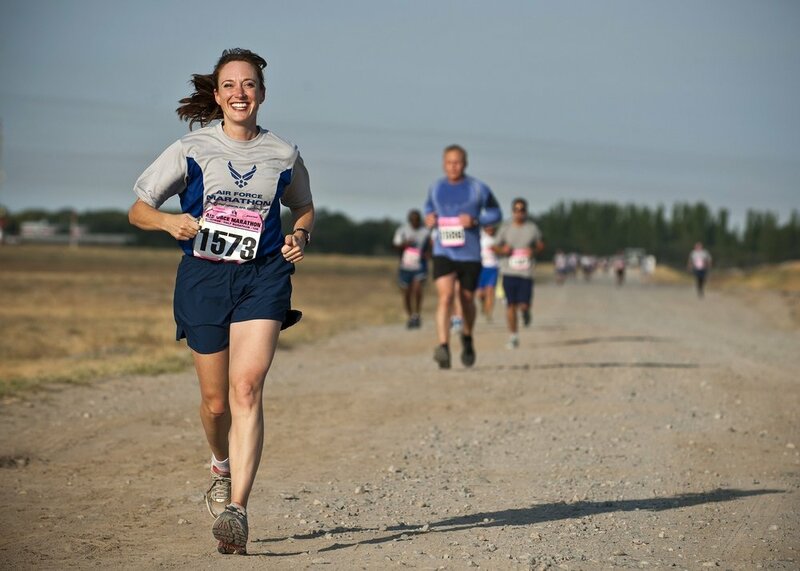 Doing a tune-up half-marathon a few weeks before your marathon is an excellent way to determine a realistic time for your marathon. You can plug your half-marathon time into a race time predictor calculator and find out what's an achievable race pace. Knowing what pace you should be running during your marathon will help you avoid going out too fast and fading in the later miles. Many runners who are shooting for a faster marathon time assume that running hard almost every day will make them faster. Rest is critical to your recovery and injury prevention efforts, so don't forget to take at least one day off completely each week. Your muscles actually build and repair themselves during your rest days. So, if you run hard every day without taking recovery days in between your hard workouts, you don't give your body a chance to recover and build itself to be stronger. More: Do Runners Need Rest Days? Tempo runs help you develop your anaerobic threshold, which is critical for running faster. To do a tempo run, start your run with 5 to 10 minutes of easy running, then continue with 15 to 20 minutes of running near your 10K pace. Finish with 5 to 10 minutes of cooling down. If you're not sure what your 10K pace is, run at a pace that feels "comfortably hard."